Obvious Child is the name of a new film which seems to be a romantic comedy exploring the lighter side of abortion. Apparently some critics like the idea while most conservatives hate it, along with the audience, whose opinion should matter most considering they are the ones who are expected to buy tickets to see the movie. Jonah Goldberg has some things to say about the wider implications of this film’s failure at the box office which I caught in his column at Real Clear Politics. Donna’s talking about her abortion appointment. Get it? It’s funny because it’s true. Or if you’re like me, you think it’s not funny because it’s true. Many critics think it’s funny. One dubbed it “far and away the most winning abortion-themed comedy ever made.” Of course, as an artistic genre, that’s setting the bar pretty low, like serving the best gas-station sushi in the state of Oklahoma. Since it opened last month, the film has grossed less than $2 million. Compare that to 2007’s Juno, a brilliant film widely seen as pro-life (at least among pro-lifers), or Knocked Up, a raunchier romantic comedy also hailed by abortion foes, both of which grossed more than $140 million domestically. Obvious Child, then, seems less like the cultural watershed its friends and foes make it out to be and more like a barely successful art-house flick. My late friend Andrew Breitbart liked to say that politics is downstream of culture, meaning that any truly successful political turnaround needs to start by changing popular attitudes. Adam Bellow, a storied editor of conservative books, has a similar conviction and is trying to launch a conservative revolt in the world of fiction. I wish them great success. Still, I think there’s something missing in this ancient conversation on the right (conservatives have been making such arguments since the 1950s — if not the 1450s, with the publication of the Gutenberg Bible). Conservatives refuse to celebrate, or even notice, how much of the popular culture is on their side. Sure, Hollywood is generally very liberal, but America isn’t. Judging by their campaign donations, Hollywood liberals are very supportive of abortion rights. But there’s a reason why sitcoms since Maude haven’t had a lot of storylines about abortion. Indeed, nearly every pregnant TV character treats her unborn child as if it’s already a human being. The Left may be anti-military, but such movies tend to do poorly, which is why we see more pro-military films. Similarly, it’s a safe bet that Hollywood liberals loathe guns. But you wouldn’t know that by what they produce. Not many action stars save the day by quoting a poem. Most Hollywood liberals probably oppose the death penalty, yet they make lots of movies where the bad guy meets a grisly death to the cheers of the audience. The Left rolls its eyes at “family values,” but family values are at the heart of most successful sitcoms and dramas. I think he is right, as far as it goes and certainly Hollywood is missing opportunities for profit by taking up such a position of opposition to the values of so many mainstream Americans, but I think there is a more fundamental reason why Obvious Child is not doing better at the box office. Abortion is not funny. Abortion is a serious matter. As with most matters of life and death, it is not a subject that can be taken lightly. For people on the pro-life side, abortion is murder on a large scale and a comedy about abortion is in as much poor taste as a comedy about the Holocaust. People on the pro-choice side may not feel quite the same way about abortion, but except for a few extremists, the sort that Rush Limbaugh used to call “feminazis”, they are aware that it is a serious and controversial subject. Thus, a movie like Obvious Child which seems to treat abortion as of no greater significance then getting a pedicure, is going to offend everyone but those few extremists. I am glad that Obvious Child is not doing well. The degeneration of our popular culture seems to be accelerating at an ever faster pace and I am glad for any sign that there are still limits to what we are willing to watch. Neither does Ben Shapiro and neither did his mentor Andrew Breitbart, which is probably why Breitbart devoted his like to exposing the biggest bullies of all the contemporary Left, and why Shapiro continued his work by writing Bullies: How the Left’s Culture of Intimidation and Fear Silences Americans. 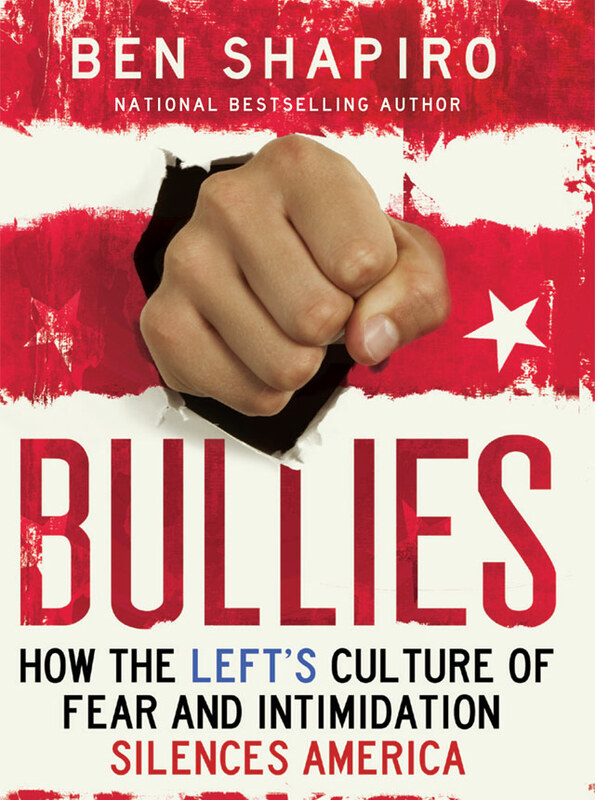 In Bullies, Ben Shapiro describes in exacting detail how the Left uses bullying tactics to shout down and silence all who oppose them. He tells how Leftist bullies in government, in the media, on the university campus, and elsewhere use their position and power to force their viewpoints on people. He writes how liberal bullies in politics use the nastiest and slimiest personal attacks against conservatives to get their way, and then blame the conservatives for the incivility in politics. Green bullies want you to be poor to save the Earth. Secular bullies want to forbid you from praying in a public space. Race and class bullies want to pit Americans against each other. Anti-patriotic bullies want you to be ashamed of your own country. The entire Left is composed of bullies who want to tell you what to do. If you don’t like it, than sit down and shut up. Luckily, Ben Shapiro is able to relate these stories of the power hungry, bullying Left with a sense of humor. Otherwise, this book might be painful to read. As it is, he writes with just the right, slightly mocking touch that makes his book actually fun to read. Like all bullies, the Left does not like to be laughed at and maybe more books that are humorous will help to put them in their place. Ben Shapiro concludes Bullies with a rousing appeal to his readers to pick up Andrew Beitbart’s mantle and continue the fight against the thugs and bullies of the Left. Bullies who are unchallenged only get worse so if we want our descendants to live in a free country, we have no choice but to fight them. By the way, if there is any doubt that Leftists are nothing but bullies, check out the one-starred reviews of this and other conservative books. There seems to be a clique of people who have nothing better to do, they probably collect unemployment, but to publish nasty reviews of books they have not read. Typical.